But which is better? Well, we're going to tell you. Never mind that they're totally different products with wildly differing features, we love comparing things, and you want to know what to spend your money on, right? We're going with classic boxing rules. Fight! The Kiband isn't actually available yet, which makes it a clear loser in this category to be honest with you. You can sign up for pre-order information on their website though. The Razer Nabu X is available right now for £45, just drop into the Razer online store and grab yourself one (though you will have to shell out £15 on postage). Result: A 10-8 round for the Razer Nabu X.
Kiband comes out of the corner strong for round 2. Although it's clunky, it achieves the primary goal of being glaringly obvious on your child's wrist, and impossible for them to take off via the locking system - only the parent or caregiver can unlock the band, via a code on their smartphone. It's not exactly aesthetically pleasing, but it doesn't need to be. It's efficient. The Nabu X has shelved the text display on the older Razer Nabu in favour of a line of LEDs, which can be customized to different colours for different alerts. 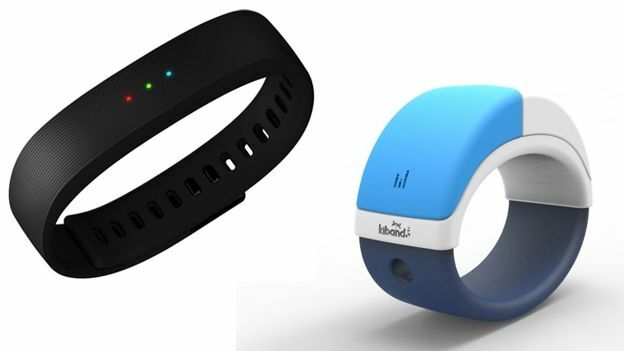 We actually prefer the new look - it has a sleeker, Nike FuelBand feel to it, and it's smaller and lighter than the original Nabu and indeed, most fitness bands. Result: Tough round to call, but we reckon the Nabu X just about managed to outwork the Kiband here. 10-9 to Nabu X. Neither of these have a screen, so they both lose. You don't get any points for LEDs, Nabu X, shush. Result: Neither one throws a punch for the entire round. The crowd is booing. One man throws half an Old Fashioned into the ring and is escorted out by security. The Championship Round, people! Kiband senses it's on the brink of defeat, and comes out swinging. Once the child is locked in, he or she will get a vibration warning when they're getting too far away from you, and a reminder to look for you. If they keep walking away, a loud, audible alarm will go off, warning nearby law enforcement that there's a fugitive on the loose. And making them easier for you to find, obviously. It'll also alert you immediately if the Kiband becomes submerged in water, so you can politely ask your son to stop drowning, or peeing on his hands. The Nabu X battles back with step and calorie counting and distance tracking. It'll tell you how long you sleep for as well, but doesn't have the extensive sleep tracking of products like the Withings Pulse Ox - this is a basic fitness tracker at a budget price. There's some nice NFC functionality too, if you high five another Nabu wearer, you'll trade contact details, which could be awkward if you like high fiving strangers in parks like we... don't. Result: 10-9 Kiband. It came out fighting but it's too little too late for the burly American safety bracelet. So, it's a victory for the Razer Nabu X. The Kiband is promising, but it just didn't turn up (literally, it doesn't actually exist yet) and there are other similar products at around the same stage of development. Until we see a working version it'll be difficult to see it winning another bout. Meanwhile, the Nabu X should hold its head high. Sure, it's basic in terms of functionality, but there's plenty to like about the minimalist chic design, and at £45 its not going to leave a big hole in your wallet. Head over to the Razer shop for more info, and goodnight!